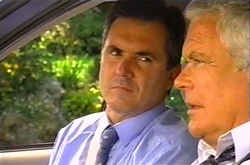 - Tad tells Paul that he thinks Harold should still go to Paris and Paul should go with him. - Lou goes to take some more painkillers, but finds the bottle is empty. Karl is packing for his trip when Lou comes in. He asks Karl if he's seen Harold and Karl is worried about how quiet Harold is. Karl asks Lou how he is and Lou asks him casually for another prescription. Karl says he was hoping he'd have graduated to over-the-counter stuff by now, but Lou says they don't touch the pain. He tells Karl that his last prescription was some time ago. Karl asks him how many he's taking a day. Lou says he's taking four - he's tempted to take more sometimes but he limits himself. Karl says he'll give him a prescription in the morning but Lou says in a rather panicky voice that he's in pain now. Karl says he just wants to be sure that Lou isn't over-medicating - he wants to know what happened to the rest of the pills he gave Lou. Susan asks Tad if he has a shirt for tomorrow. She offers to iron anything he wants. Then she thanks him for getting Jess to tell the truth about the incident at the school. This is news to Tad and he is very pleased indeed that Susan is off the hook. He doesn't think he does a lot, but Susan says he's underestimating his influence on Jess. Karl can't understand how Lou can put one prescription through the washing machine and lost the rest - Lou says he dropped them on the floor at the pub. Karl is a bit suspicious and says that Lou's physiotherapist reports that he's making good progress - he shouldn't need the painkillers by now. Karl says he has to be honest - it's not uncommon for people to become addicted to painkillers. He wants to try something else instead. 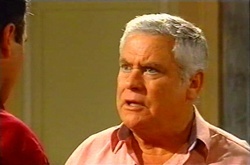 Lou becomes agitated when Karl says he must stick to across-the-counter painkillers from now on. He is outraged that Karl won't give him another prescription and storms out. Dee and Tess have brought a cake for Harold. He tells them that everything is covered for tomorrow - Lou is doing the refreshments at the wake. Tess asks how the boys are and Harold says they're holding up. They chat about the sale of No.32 and then Lou arrives as they are leaving. Lou comes in and asks Harold if he has any painkillers in the house - he says he's run out and can't get a prescription until tomorrow. He's disappointed that Harold hasn't got any prescription pills - only over-the-counter. Harold suggests going to see Karl for a prescription. Lou smiles thinly and says nothing. Tess and Dee come round to see Toadie. He's still worried about his case. Tess has relented and has decided to move in to No.30 after all - she can't find anywhere else. Toadie tells them that Joel has decided to stay and Dione is not pleased - she doesn't want to live with him. Toadie says that Joel said the same thing about her! While they are talking, Toadie sees an envelope on the table and picks it up. Toadie opens the envelope to find a letter from Joel inside - apparently he's gone to Mal's wedding in England! (Like you do!!) Toadie is surprised - he didn't think Joel was going, but with all the trouble with Flick he probably gone away to clear his head. Dee is not pleased - she says they'll both have to go house hunting. Toadie animatedly begs them not to - he needs someone to pay the rent. He says they could move in for a few weeks and work things out when Joel gets back. Susan is helping Tad and Paul to tie their ties to go to the funeral and tells them that Madge would be very proud. They stand there quietly and Paul starts crying. Tad tells him not to - he'll make it harder for Harold. But Susan says it's good to let it out and not keep it bottled up inside - there'll be loads of people crying at the funeral, so he'll be in good company. Karl comes in and asks where Harold is - apparently he is in the garden. Susan quietly asks Tad how he is. He doesn't think it's a good idea if they all start crying - one person needs to hold the fort and he's going to try to be strong. Susan says that he has to let his grief out somehow and Tad says he'll just do it in private. He's talked to Coral about it a bit on the phone. He says he's luckier than Paul and Harold - he's still got one mother. Susan hugs him tightly. The neighbours are getting into cars to go to Madge's funeral. 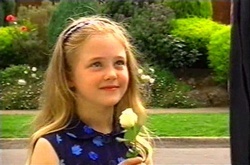 Karl asks Lou how he is and he says he's OK. Lolly has picked a flower - a white rose - for Harold and goes over to give it to him. Harold thanks her and puts it in his buttonhole. Karl, Lou and Lolly get into a car together. Karl needs to know if Lou is taking more painkillers than he should. Lou says that maybe he has taken a few extra, but he's stopped now. He didn't have any last night and he feels fine today. Karl says he'll keep checking on him to see how he's getting on. The cars drive off. Harold is touched that so many people have turned up to the funeral and Lou tells him that Madge was loved by many people. Nathan from football training has turned up, much to Paul's surprise. Nathan said that Madge was always nice to them at the Coffee Shop. Paul tells him he might be going away for a few weeks. 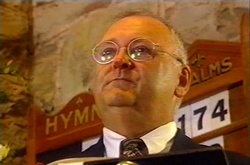 Everyone starts to go in and Harold's Salvation Army friend asks him if he's ready. Harold puts his arms round Tad and Paul's shoulders. TAD: We'll get through this together, OK? PAUL: Just remember - she'll be watching us. They go into the church. Harold is giving Madge's eulogy. 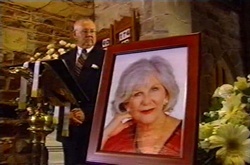 Next to him at the front of the church is a giant photo of Madge. "I fell in love with Madge back in high school - she was feisty, self-assured and very, very beautiful. She was the most popular girl at school. I was the fat, foolish awkward boy she hardly ever noticed. 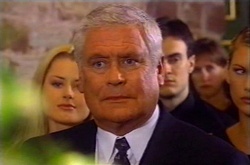 See, the hero in those days was the school football captain, Lou Carpenter. So I had to worship her from afar. Oh, how I worshipped her. I felt so privileged that she had chosen me. That wonderful, strong woman. Madge was a very strong personality - she was nobody's fool. And yes, I know her tongue could...but at heart, she was the most loving, caring person I've ever known. And all those here would agree with that. And would also agree that we're better people for having known her." Harold starts to sob and Tad and Paul help him back to his seat. Everyone present is tearful. Tad, Susan, Paul and Harold are standing at Madge's graveside. 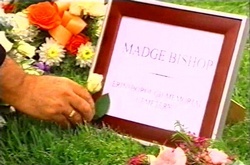 Harold takes the flower that Lolly gave him out of his buttonhole and lays it on Madge's memorial plaque. Then they all walk away sadly. Susan is serving some fingerfood at the wake. People are talking about Madge fondly - even Harold. He says that Madge would have loved to see a full house. Once she invited more guests than they had chairs so just put some cushions on the floor! Paul pulls Tad one side and asks if they should tell Harold what they've done. Tad says that they probably should. Tess, Dee and Toadie are about to leave for the wake. Toadie says he's never seen Tad so wiped out, and Paul was worse. 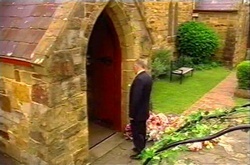 As they are leaving Toadie sees that there is a message on the answerphone. He can't be bothered to listen to it - it's probably another nutter calling about the room and he's not in any sort of mood to do interviews after the funeral. Dee says he doesn't have to - she's decided to take the room, despite the fact that Joel will still be living there. Tad and Paul are telling Harold that they've rung the travel agent and it would be easy to swap the name on Madge's ticket to Paul's, given the circumstances. 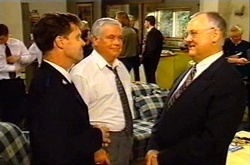 Harold says they've already talked about it, but Tad says that he and Paul reckon that Harold was wrong. Harold says he doesn't want to go now, but Paul says he'd like to go. 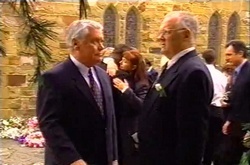 Tad tells him that Madge wanted him to go. Harold says there's too many things to arrange, but Tad says most of it is already done, and he'll take care of the rest. Harold is uncertain - he doesn't know if he wants to go to Paris without Madge. Paul says he knows it won't be the same, but Madge spoke to him about Paris and he'd really love to go and see the things that she wanted to see. They'd be doing it for her - and she'd be with them. Tad says it's easy - all Harold has to do is to say yes.